Light fittings are given IP ratings which denote how sealed they are against the elements e.g. dust and moisture. The average rating required for rooms in a house is IP20, however for bathrooms and steam rooms etc it is much higher. For bathrooms (and some outdoor use) you should look for a rating of at least IP44 and if directly above a shower, IP65. Downlights which are installed directly above a bath or shower (to a height of 2.25m) should be IP65 rated to make sure that no dust or moisture can get into the fitting. For exact info about bathroom IP-rating, please see our helpful articl and diagrams on Bathroom lighting. Often the simplest option for bathroom lights is a single flush ceiling light utilising cfl, fluorescent or LED bulbs. Some flush fittings including bathroom mirror lights can also be installed on the wall of your bathroom. Mirrors can also be used as a bathroom light source with an increasing number of different designs. An illuminated mirror adds that extra 5-star feeling to your bathroom lighting. If you have the ceiling height and don't just want a simple flush fitting we also have a range of low energy pendant bathroom lights which are also IP65 rated for bathroom use. Often used to compliment ceiling lights and put the light in your bathroom exactly where you want it, bathroom wall lights are a great addition to any bathroom. 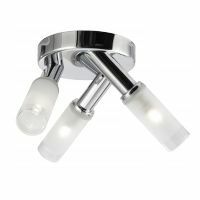 A very popular fitting to add a bit of direction and sparkle, bathroom spot lights are often the lowest energy option as many are supplied with energy saving LED bulbs. If you require dedicated low energy lighting for your bathroom extension or new-build home we have a couple of downlight ranges to choose from. The 10w Elan dimmable LED downlight is a dedicated solution and a true fit-and-forget option. You can also simply choose an IP65 downlight and then one of our range of GU10 LED bulbs for the greatest amount of flexibility and choice. If you want to compare high energy and low energy bulb options, try our energy saving calculator e.g. this comparison between a 6w GU10 LED and a 50w halogen GU10 bulb - a saving of £9.73 per bulb per year!